Although less developed compared to neighboring Thailand and Vietnam, Laos is not less spectacular and what it lacks in wealth, it more than makes up for natural beauty. As Laos culture is still heavily influenced by Buddhism which exerts a profound impact on Laotians’ perspective, attitude and behavior, it cannot be denied that Buddhist philosophies set up the Laotians’ lifestyle. Buddhism has a profound impact on Lao’s lifestyle and helps form the personalities of the people in this peaceful country. Theravada Buddhism encourages its practitioners to keep their feelings and passions in check and to appreciate their position in life. This explains the mellowness and laid-back attitude that Laotians are famous for. People often show up late and look carefree most of the time. It’s even common to see people sleeping in the office. Laotians are hardly ever in a hurry and always seem like they have all of the time in the world, contrasting with people from nearby countries like the Vietnamese or Chinese. Lao people are also regarded as genuine and extremely friendly. 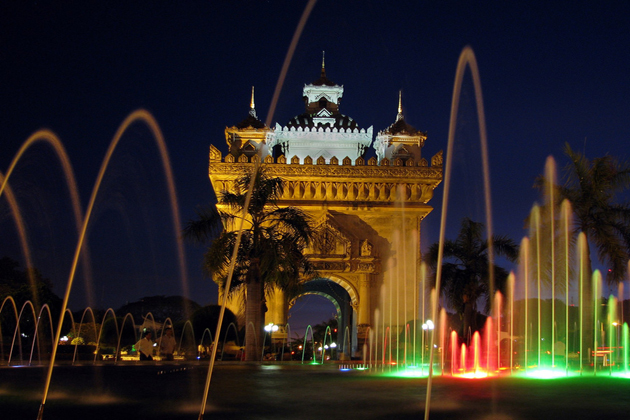 In the survey carried out by the London-based Rough Guides through its Twitter and Facebook, Laos ranked third place in the world’s friendliest countries. The fact that most Lao people are brought up in extended families explains a high level of harmony, kindness, and patience of the people. The initial impression of Laos lifestyle is the idyll and close connection between Laotians and nature in general and Laos people living along Mekong River in particular. 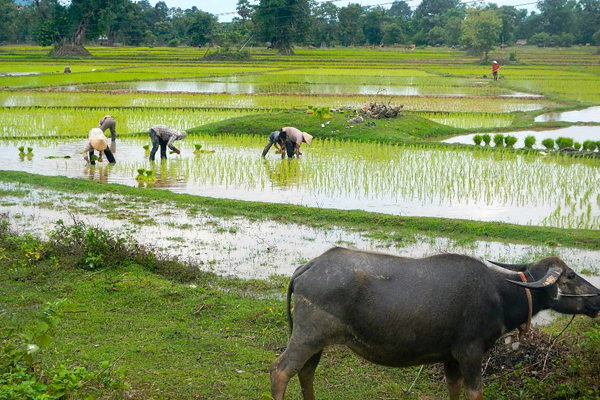 Thanks to flat and fertile terrain enriched by Mekong River’s sediment, Laos people cultivate wet rice, setting up wet rice one-thousand-year civilization. Besides, fishing on Mekong River is also an important source of income for many Laotians. A large number of Laotians builds their houses near their paddies along the Mekong River. They live in quite simple houses built on stilts as one wants to get inside; they must climb steps or a ladder. The walls are made of woven bamboo and corrugated tin roof. Laos people live in stilt house to avoid water rise high in the rainy season of Mekong River as well as keeping their castle under their house. Usually, there are 3 rooms of the living room, dining room and bedroom with no furniture in the house.They prefer extended families with three or more generations living under the same roof. Laos people prefer living in a community. Therefore, they formed villages in which people keep a close connection with their neighbors. Most of the villages in Laos have no electricity and keep backward life together with calm and steady rhythm. Except for in special festivals, the rhythm of life in Laos days after days stay the same. People in a community share the common responsibility and are ready to help each other in need. There is a very strong focus on family and being together. It is said that Laotians never eats alone and this is evident everywhere you go with families and friends gathered around the fire, all sharing food, making balls of sticky rice, singing, playing music, joking and drinking. The elderly are especially well cared for and are an integral part of the family. The designs of Laos clothing have been under the influence of by Thai, French, Cambodian and Burmese cultures. The colors and embroidery patterns of Laos traditional clothing not only identify people’s ethnicity and region but also can represent their family and clan. For example, Yao women wear long black jackets with red lapels and Blue Hmong women wear black jackets with yellow and orange embroidery. 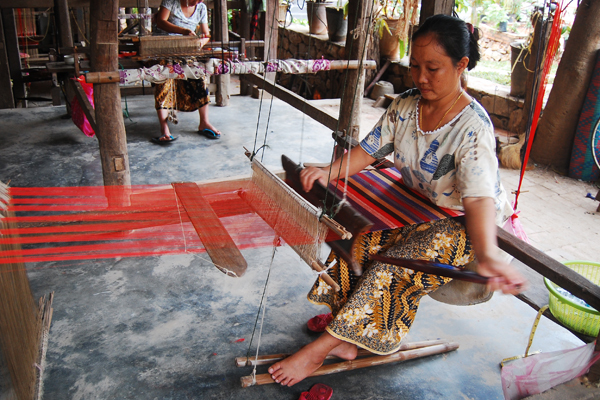 The traditional skirt of Laos is called a sinh, which consists of a wrap skirt made of cotton or silk. The body of the sinh is called the phuen sinh and typically has two colors. The hem of the sinh, or tin sinh, will have intricate designs in embroidery. The sinh’s waistband, or hua sinh, is generally not seen. 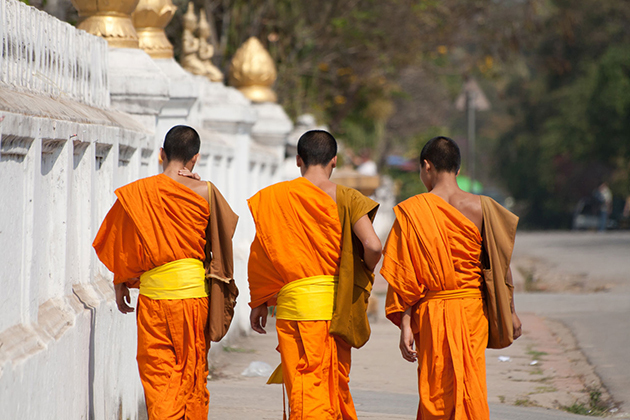 The peasant pants worn by men are traditionally in the Khmer style. Men generally wear an Indochinese shirt or jacket with a Mandarin collar. They also wear a checkered shawl, known as a pha biang. If you are a fun-lover and on a hunt for a land of delightful festivals, a Laos vacation will not disappoint as the country’s calendar is full of festivals and celebrations taking place monthly. Due to its rich culture and religion, the majority of festivals in Laos are linked to agricultural seasons or Buddhist holidays, signifying traditional aspects of Lao lifestyle. Some of the biggest festivals are Lao New Year, Rocket Festival, Boat Racing Festival in Luang Prabang, and That Luang Festival in Vientiane. 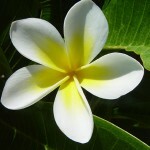 All are exciting and carry different cultural and religious meanings. In short, Mekong River and community spirit have constituted the two most outstanding characteristics of Laotians. Traveling along Mekong River, observing the simple and peaceful life of locals, trying their clothes and feeling the close connection between people and nature will give tourists once-in-a-lifetime travel experience.